Six Flags Magic Mountain lights up the season even brighter this year for Holiday in the Park select days November 17-December 30. 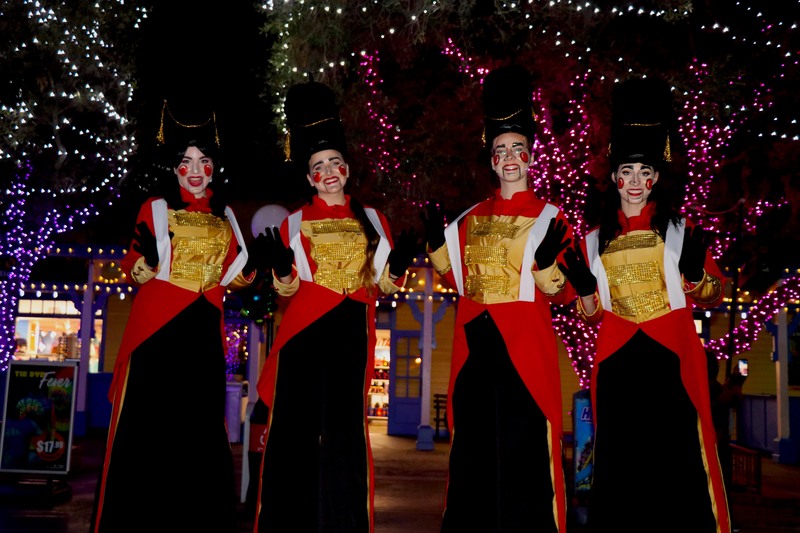 See the park transform into a magical winter wonderland with millions of twinkling lights, carolers, holiday entertainment, and your favorite thrilling rides. It’s the most magical time of the year at the Thrill Capital of the World as the park is open every day, including Christmas Day. 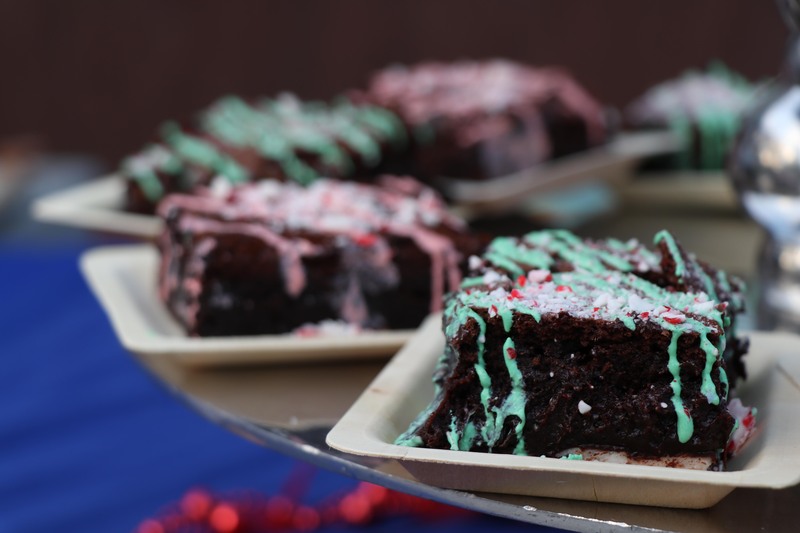 The Biggest Holiday in the Park sets a new standard for Six Flags Holiday celebrations. Six Flags Magic Mountain is known around the world for its collection of incredible record breaking rides and coasters. But if I were to ask you to tell me a park with a fantastic holiday celebration during the month of December; the answer will most likely be Disneyland or Knott’s Berry Farm. Seemingly looking past SFMM as a viable option for holiday shenanigans. 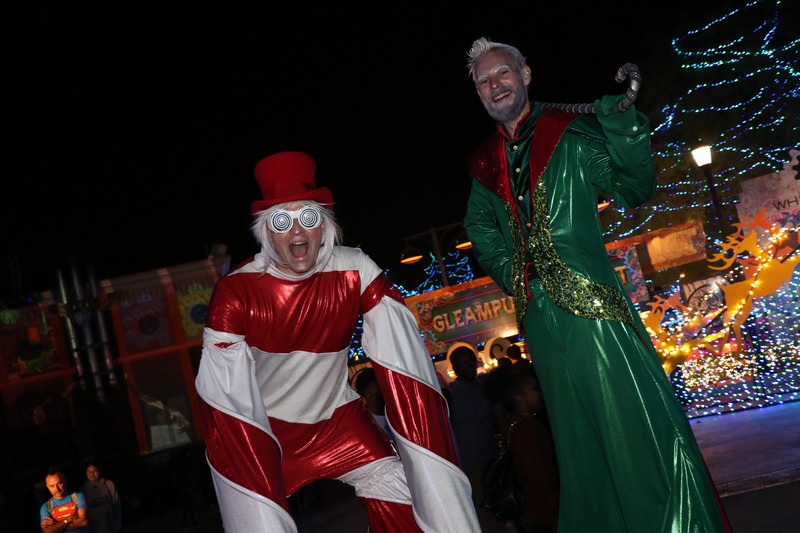 But with the past few years, SFMM has established itself as a destination for holiday fun for everyone to enjoy. This year, Holiday in the Park has gotten bigger, better and even more merry! 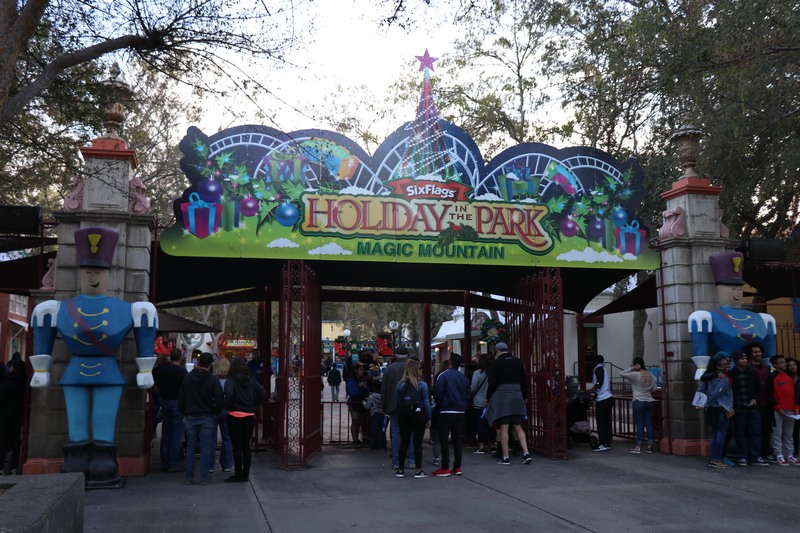 As soon as you enter the park, the area named Holiday Square, the difference between SFMM and its competitors is apparent. 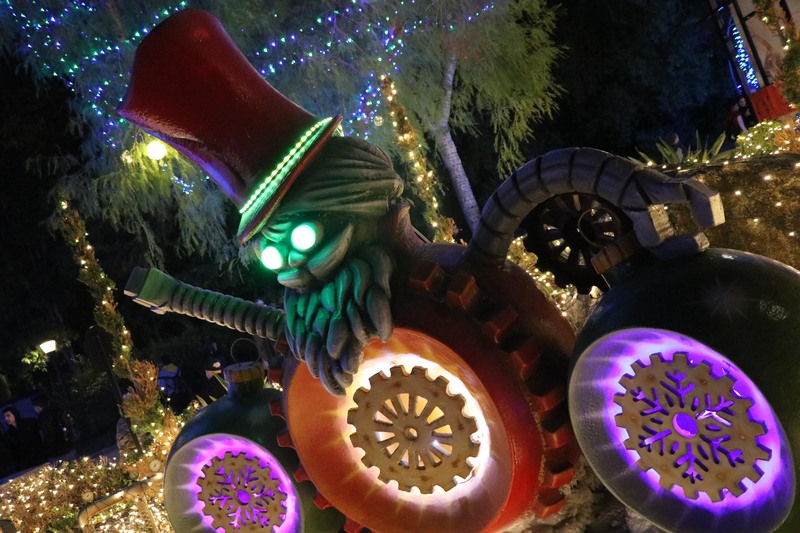 While most parks take a more simplistic and tradition take on holiday decorations, SFMM takes it in a fantastical direction, while still maintaining a familiar tone. You will find colored lights everywhere! Around the trees, around bushes, planters, light poles and anything you can think of. The whole entrance of the park perfectly sets the stage for the the rest of the event. Throughout the different sections of the park, you will find different types of decorations that mesh with the theming of the area. For instance, in the Gleampunk District, you can find steam punk version of snowmen and Santa! You will also find plenty of characters themed to their areas. This is something I’ve not seen any other theme park do with their holiday celebrations. These characters are imaginative, fun, quirky and uniquely Six Flags. Some of our favorite characters were in the Gleampunk District of the park. These two quirky characters were meetings guests and even stopped for photos. 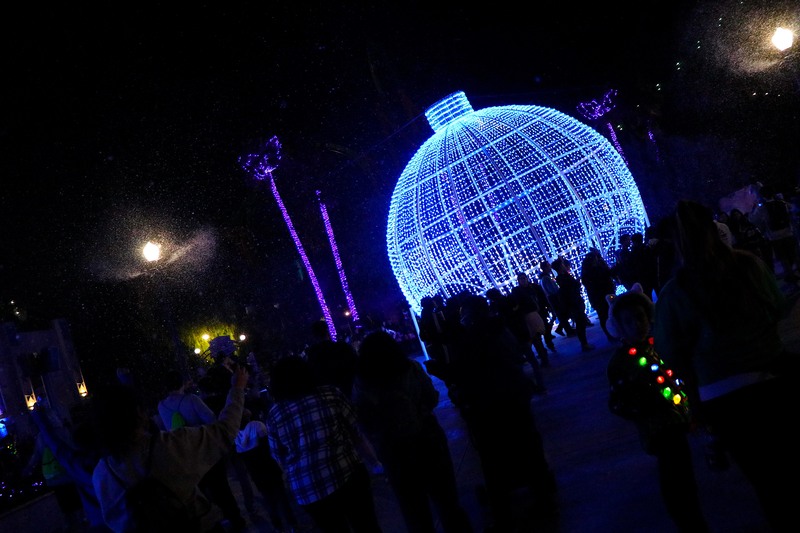 It’s this type of imaginative fun that sets Holiday in the Park above many other events. This completely adds a new level of immersion into what could simply be seen as a beautifully lit park. But now each and every area has a unique and fun personality because of its inhabitants and decorations. One of the newest additions to Holiday in the Park is Merry Lane! This is right in front of the Hall of Justice. 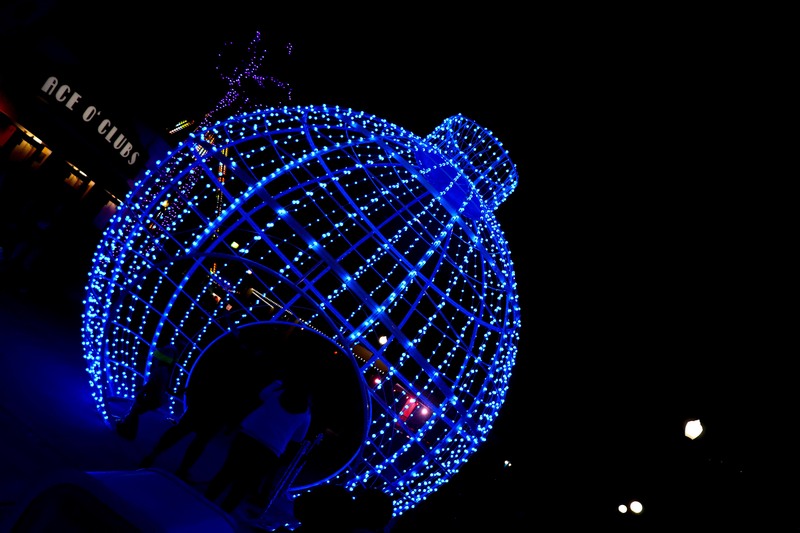 Massive round ornaments, made of string lights, flash and change with the holiday music. Every 20 minutes, a light show begins where the lights in the entire area are synchronized with classic holiday favorites. Not only that, but it also snows! During one of the shows, I sat down with my hot chocolate and just felt an overwhelming sense of happiness. The music, lights, snow and my hot chocolate all helped create the perfect holiday atmosphere. This area of the park was a selfie takers paradise! You could walk through the monstrous ornaments and the pictures that would come out would be rather fun! Even I couldn’t resist the moment! On your way up the hill towards Katy’s Kettle, you will find Winter Wonderland. This is the area of the park, that if it’s truly a chilly night, you can forget that you lived in Southern California. 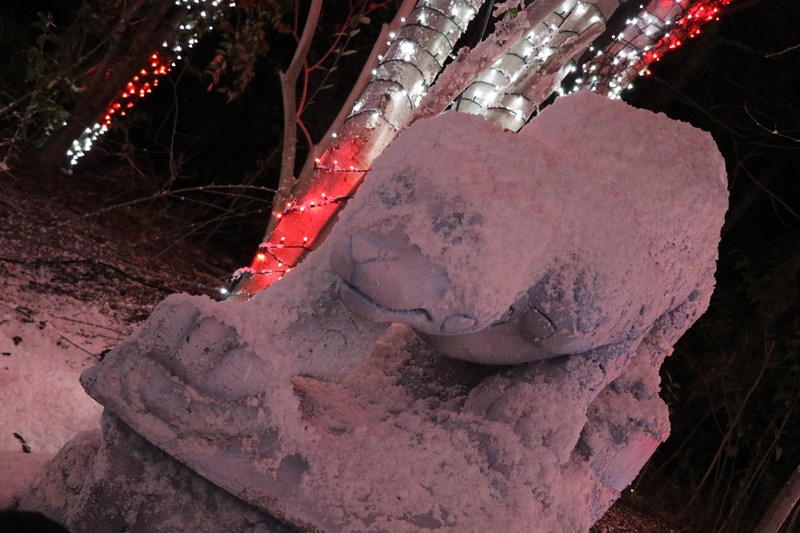 The fake snow, the massive snow sculptures, the candy cane like trees and the occasional snow fall all create a wonderful Christmas atmosphere. I only wish this area extended much further down the path! This is actually the area of the park that I heard someone saying “Now THIS makes it feel like it’s Christmas!”. That statement alone is proof that the work the team at SFMM is doing not only leaves an impression on its guests, but that their work is simply astounding. 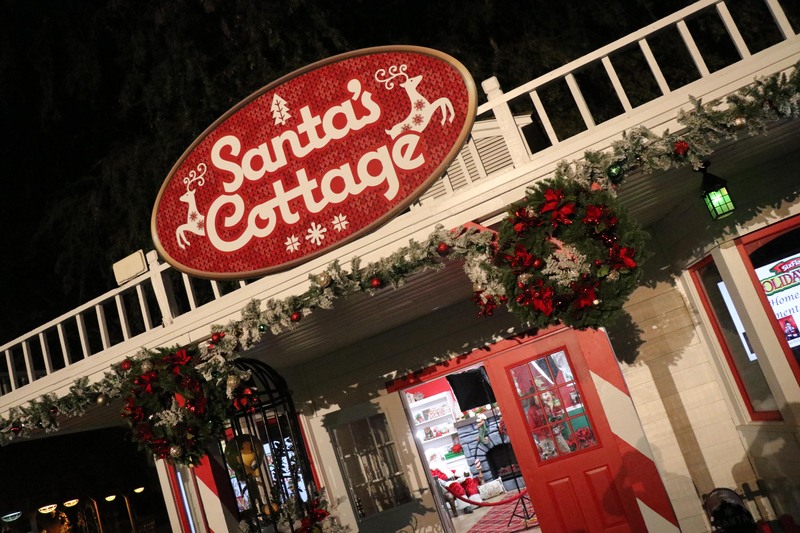 Near Bugs Bunny World, you can find Santa’s Cottage where you get to meet the big man himself, Santa Clause! The meet and greet starts with a moment with Santa and then an optional souvenir photo for proof that you met the man himself! Outside the cottage, you will find the sweetest woman ever, Mrs. Clause! Mrs. Clause is sometimes a forgotten face during the holidays and even at holiday events. But SFMM made sure to have a place for Mrs. Clause and we are so happy they did. Outside the cottage, kids can color and create some arts and crafts to take home. Right outside the fence of this area you can purchase a s’mores pack to roast your very own marshmallow! 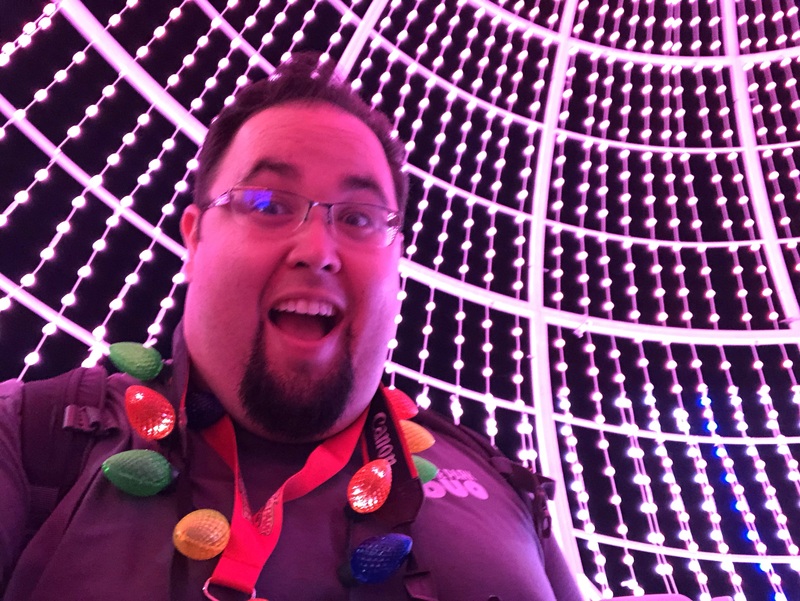 What may seem to be a trivial addition to the over outstanding amount of entertainment at the park is actually a much bigger piece of the puzzle that helps create the tone and warmth of the holidays. Taking the time to roast marshmallows with friends and family is such a departure from what one would think a theme park would offer. It is such a welcomed break from the coasters and even the lights and music. Sometimes the holidays don’t necessarily mean presents, light, music, and Santa. Sometimes it means slowing down and appreciating the moments you have with your family. 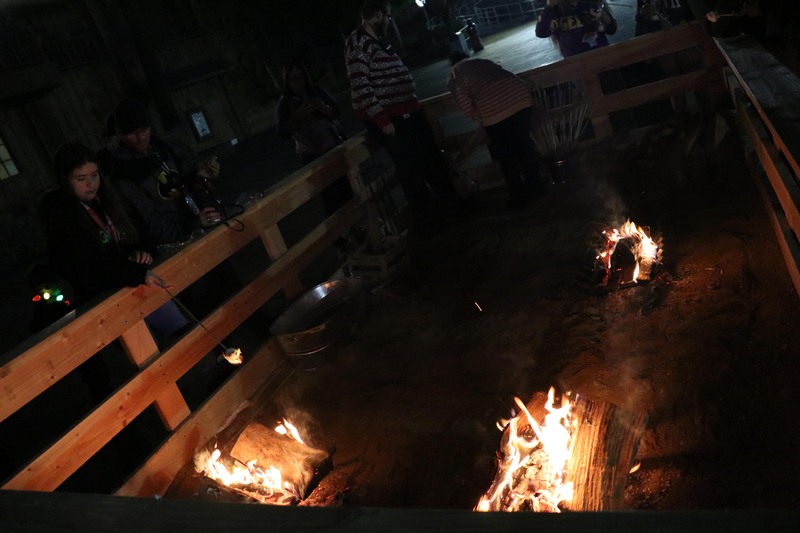 This small addition to the S’more fire pits here and throughout the park is a great addition that allows for a full spectrum of options for celebrating the holidays and creating memories with friends and family. Outside of the light shows and characters in each area of the park, there is a ton of entertainment offerings each night of Holiday in the Park. Over by Full Throttle, you will find the Full Throttle Snowy Nights Stage. 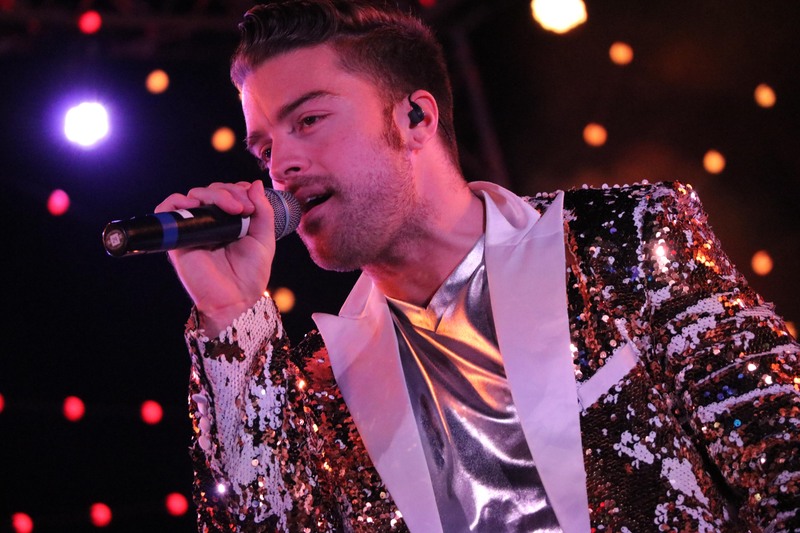 Acts like: The Mistletones, Tinsel Toy Dancers, DJ and percussionist can be found here churning out their versions of holiday favorites during a contemporary show. Although we may not be the target demographic for shows like this, we can still appreciate the fact that the band was engaging and had a rather large audience. When you are fighting for attention between your music and massive roller coasters and still have a crowd, I’d say you have a damn good act on your hands. 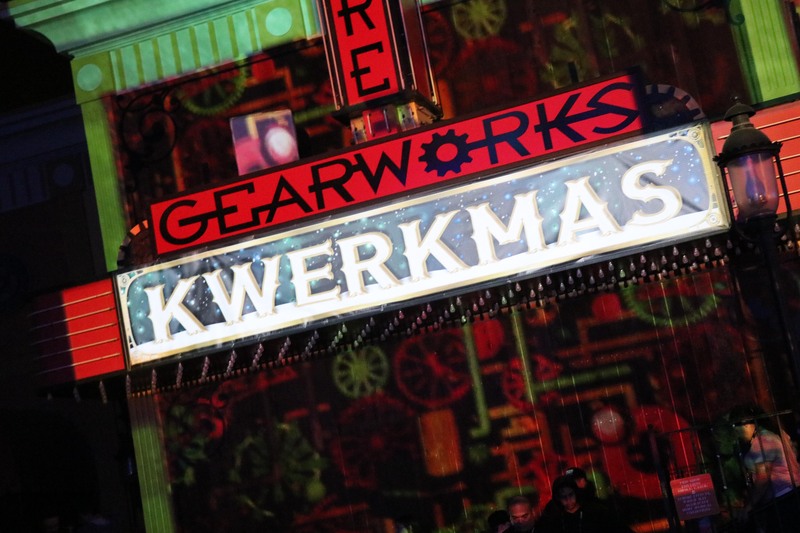 Holiday in the Park also had a rather large stage show in the Gearworks Theater over in the Gleampunk District called Kwerkmas. Unfortunately we did not get to see the show this year, but we did last year and we thought it was a fun show that fit the theme of steam punk. Like the name suggests, it’s quirky, but it doesn’t really tell you want the show is actually about. Kwerkmas is centered around acrobatics with a holiday twist. It’s rather fun and very high energy. A show to help you rest your feet while keeping you highly entertained. 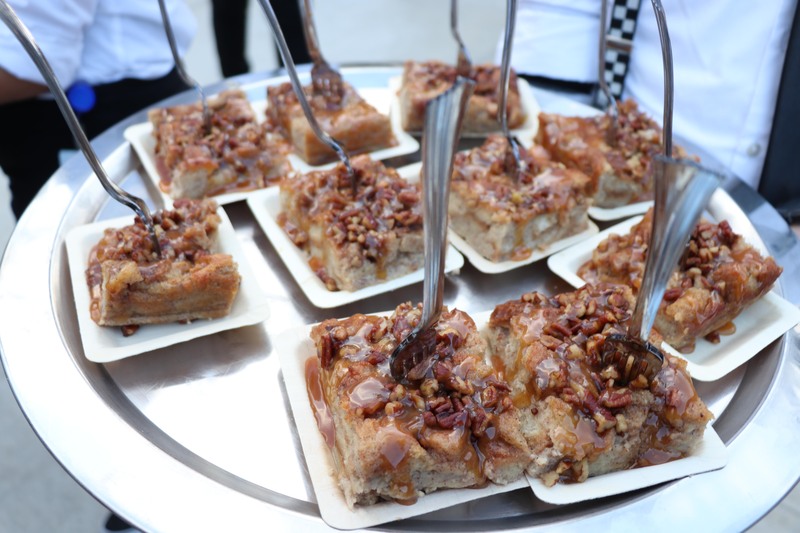 We had the wonderful opportunity to try these delectable treats and we can say easily that it was some of the best food SFMM has ever produced for an event. We highly recommend getting a tasting card when visiting so that you can try a bit of everything. If you decide to just go with a simple burger during your visit, you are missing out BIG TIME! Some of our favorites were the Brie Sandwich with apples and turkey, the prosciutto mac and cheese, and the bread pudding! The only chagne we would make to Taste of the Holidays would be its length. It’s simply too short and we would love to see it run the length of the entire Holiday in the Park celebration. After leaving last years Holiday in the Park, we thought it would be hard to top it. This year, the whole SFMM team has completely set a new standard for themselves and Holiday in the Park. 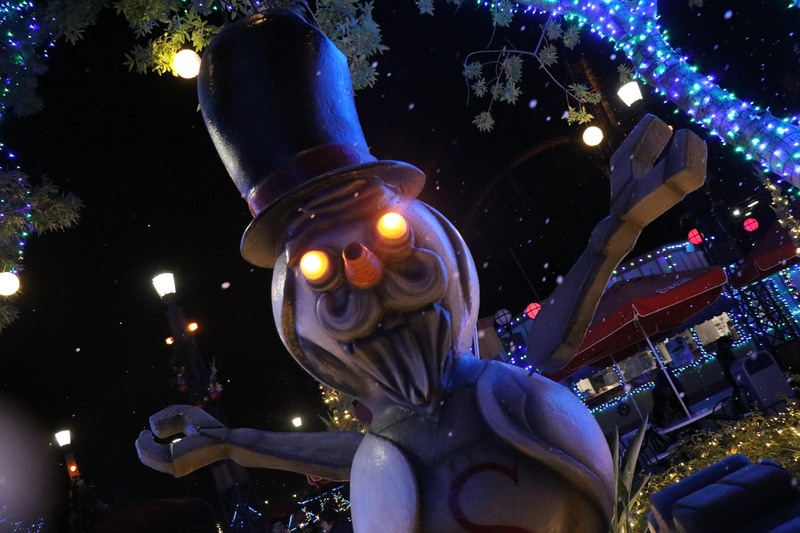 From the food, to the decorations and the characters; SFMM completely transforms into a whimsy filled winter wonderland that is a treat for all the senses. Again like Fright Fest, the only down fall for Holiday in the Park would be the size of the park itself. Because 90% of the park is meticulously decorated, the 10% that isn’t really stands out. Specifically the area from Bugs Bunny World, all the way to Superman. Like Fright Fest, there was minimal lighting and minimal decorations. We would love to see some snow flake lights projected on the floor, or even the more elaborate lighting you find in many other portions of the park. 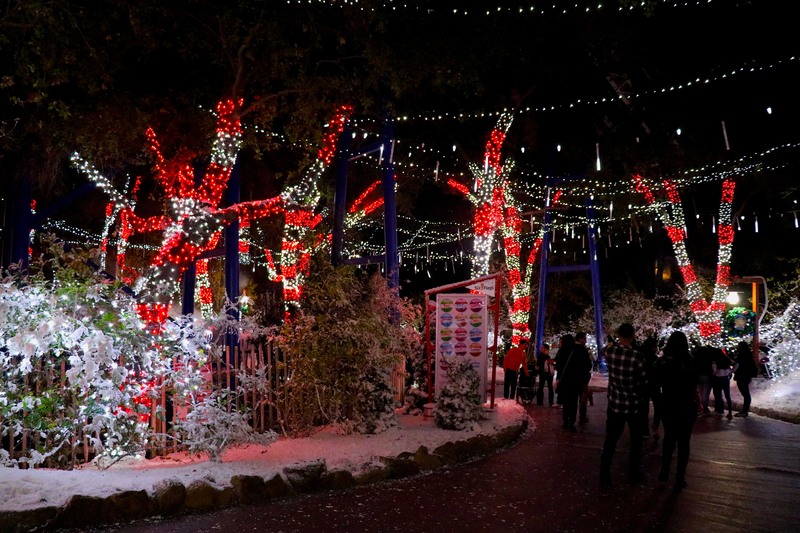 Other than this minor gripe, SFMM is a major destinations for those who love the holiday season. 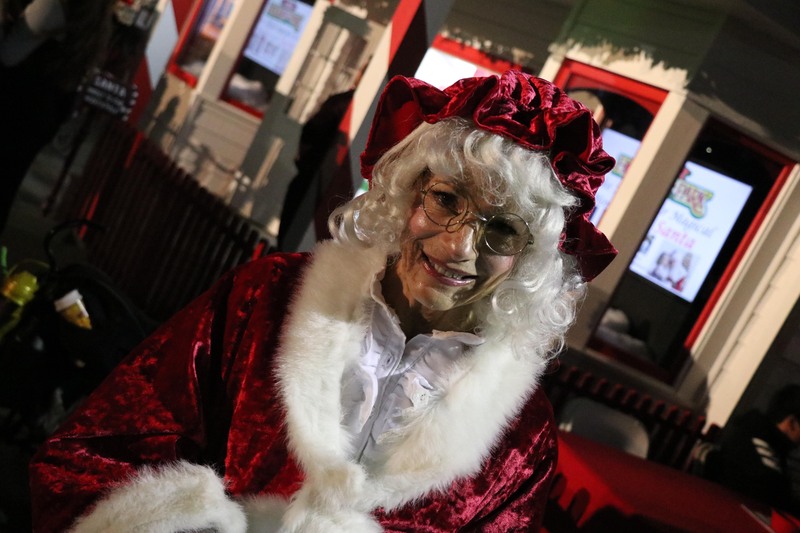 After attending, we guarantee that the next time someone asks you which theme park has a fantastic holiday event, Six Flags Magic Mountain will be on that list! Congratulations to the entire Six Flags Magic Mountain team for creating such a wonderful event for the holiday season! To buy tickets to Six Flags Magic Mountain, CLICK THIS!